There are no bouncing bumbles here! Instead, the Down Placers take on the most dreaded beast of the Himalayas – The Abominable Snowman (dir. Val Guest). The winter holidays are winding down, but we’ll keep the chill going by taking a look at one of Hammer’s wintery-est films starring Peter Cushing, Forrest Tucker . . . and maybe a yeti or two. 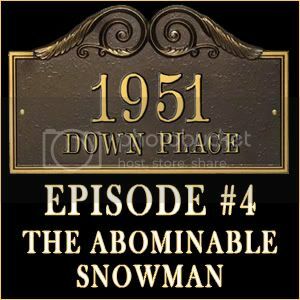 Download 1951 Down Place: Episode #004 here! DisneyPark. “Inside Expedition Everest®.” DisneyPark’s Channel. YouTube, 10 June 2008. Web. 12 Dec. 2011. Guest, Val. So You Want to Be In Pictures. Richmond, England: Reynolds & Hearn, Ltd., 2001. Print. Huckvale, David. Hammer Film Scores and the Musical Avant-Garde. Jefferson, NC: McFarland & Company, Inc., 2008. Print. Meikle, Denis. A History of Horrors: The Rise and Fall of the House of Hammer. Lanham, MD: The Scarecrow Press, Inc., 2009. Print. The Abominable Snowman. Dir. Val Guest. Perf. Forrest Tucker, Peter Cushing. Anchor Bay Entertainment, 2008. DVD. The Abominable Snowman (DVD commentary). Dir. Val Guest. Perf. Forrest Tucker, Peter Cushing. Anchor Bay Entertainment, 2008. DVD.